ABOVE & BEYOND "We are all we Need" - Otter Productions Inc. | Otter Productions Inc. ABOVE & BEYOND "We are all we Need" - Otter Productions Inc.
★ CONCERT ANNOUNCEMENT ★ Insomniac Events, Collective Effort Events and Otter Productions, Inc. are thrilled to be bringing electronic dance music legends Above & Beyond for what will be the BIGGEST Summer concert yet! 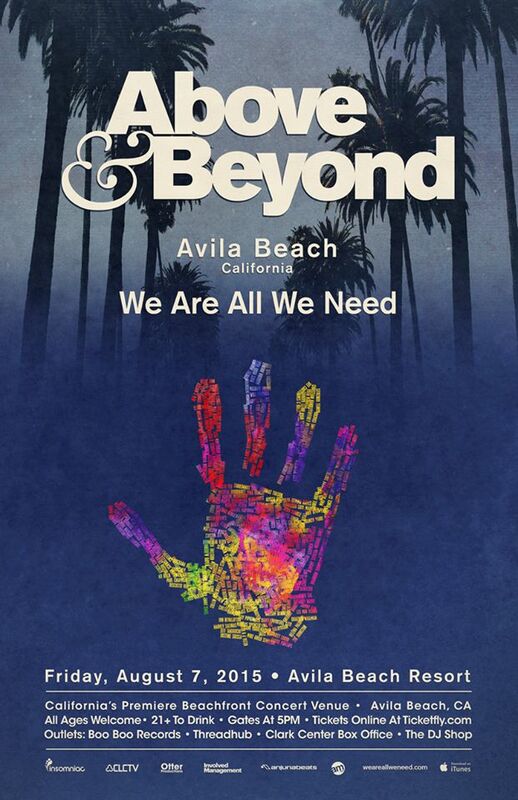 Join us on Friday, August 7th for Above & Beyond’s ONLY California show date on their upcoming summer tour! This will be an unforgettable night under the stars in Avila Beach! 18 and up, please. At Collective Effort Events and Otter Productions we strive to deliver safe, quality, well-operated events for concert attendees from all over California. All of our concerts in Avila have traditionally been “All Ages” shows. That being said, due to a new partnership we have formed on this particular show only (Above and Beyond-Avila Beach) with international event producer INSOMNIAC, we are not able to allow all ages to attend. This concert is now an 18 and over show. We truly apologize for any inconvenience this may cause. We understand there was conflicting information online regarding age limitations. This was out of our control and again we apologize for any inconvenience. If you are under 18 years old please get full refunds from TICKETFLY BEFORE JULY 31st, 2015. Ticketfly will be sending an email to every ticket buyer with information on how to receive a full refund if you are under 18 years old. If you purchased your ticket from a local retail outlet, please return to the point of purchase for a full refund. PLEASE NOTE THAT ONLY ATTENDEES THAT ARE 18 AND OVER WILL BE ALLOWED TO ENTER THE VENUE. IF YOU ARE UNDER 18, EVEN IF YOU HAVE A TICKET, EVEN IF YOU ARE WITH FRIENDS WHO ARE OVER 18, YOU WILL NOT BE ALLOWED TO ENTER THE VENUE. EACH AND EVERY PERSON WILL BE REQUIRED TO SHOW A STATE OR FEDERAL ISSUED PHOTO ID IN ORDER TO ENTER THE VENUE. If there are any additional questions or concerns we ask that you DO NOT call the venue direct, but email info@collectiveeffortevents.com and we will do everything we can to assist in your inquiry. If you (and your party) are over 18 years of age we are VERY excited to dance the night away under the stars near the beach with you on Friday, August 7th. Thanks for your understanding and your continued support! – Collective Effort Events and Otter Productions, Inc.